Reno, Nevada, is constantly being overshadowed by the other popular Nevada city, Las Vegas. Reno is also a city with an unpleasant reputation of being a gambling and divorce hub, but in the current years, it’s slowly shaking off that unsavoury reputation. This city is slowly going through something of a modern renaissance. In downtown Reno, hip eateries and cool art galleries are popping up in large numbers, making it feel like a shell of its old self. There are also plenty of kid-friendly attractions like Terry Lee Wells Nevada Discovery Museum, making it a family-friendly vacation spot! So what are you waiting for? Check out our favourite Airbnb vacation rentals and head on over to Reno for a break! Tucked into the corner of this quaint Airbnb vacation rental is a plush double-size bed, which makes sleeping very easy. You can also admire the view of the mountains when you’re here. Jump out of bed and get started in the morning by cooking something simple in the small but reliable kitchenette. Also, feel free to wash up or go about your daily business in the fully-equipped bathroom. You could head out for some fun, like releasing the inner child in you and bouncing on the trampoline or just relax while hanging out on the hammock. Cuddle up on the large sofa while watching TV comfortably, and when you want a snack, you can come up with a basic meal in the well-appointed kitchen. The pleasant king-size bed in the Airbnb apartment will help you in catching up on some restful sleep, in the spacious and vibrant bedroom. As you’re provided with basic toiletries and towels, you won’t have to pack them with you and can just wash up with ease. You’ll also be sharing the washer and dryer with the host, so if you need to wash your clothes, you can do so! Treat yourself to a delicious, home-cooked meal by cooking in the kitchen and tucking into it at once at the counter bar. You can catch up on some tranquil sleep while on the pleasant king-size bed in the Airbnb’s vibrant master bedroom. The second bedroom is not to be scoffed at as it’s equally as comfortable and has plenty of storage space to put your belongings away. After a long day out, you could have a relaxing soak while in the bathtub, or do your laundry. Relax and enjoy the fresh air as you have a seat outside the vacation rental. LOCATION! Charming! Quiet & Safe! Have a seat on the soft sofa and warm up by the fireplace of this Airbnb on a cold day, and if you’re starting to feel hungry, you could make use of the well-appointed kitchen to whip up a delicious meal. There are two identical bedrooms, each of them are roomy and they come with a queen-size bed each. Choose your favourite amongst the two and you can have a restful sleep in either of them. However, only one bedroom has the entrance to the porch where you can relax and unwind while enjoying the sights and sounds of the garden. Also, if you’re here during the summer, you can have a splash and cool down in the swimming pool. Cheery and colourful, the living room is an amazing space that will surely allow you to relax and unwind. When night falls and you want to head to bed, you can retreat into any of the 3 bedrooms in this Airbnb oasis. There are 2 bedrooms downstairs, with 1 bedroom consisting of a queen-size bed, while the other bedroom has a full-size futon, while the 1 bedroom upstairs has a queen-size bed too. So choose a bedroom and sleep comfortably. Pamper yourself by having a soak in the hot tub, or just hang out in the hammock while admiring the beautiful garden. Enjoy watching as much TV as you can from the comforts of the velvety sofa in this Airbnb townhouse, and you can even light up the indoor fireplace and keep warm on chilly days. As the kitchen is large and well-appointed, there’s plenty of space to move around and to prepare a meal with ease. Fall asleep comfortably on the king-size bed in the master bedroom, and from it you could also watch TV. The second bedroom is smaller but is still as comfortable so you can sleep restfully. Lastly, the third bedroom acts as a makeshift office where you can complete some work if necessary. If not, grab the full-size airbed from the closet that can accommodate 1-2 people easily and have a wonderful rest. Catch up on some well-deserved and tranquil sleep in your own bedroom, and at the foot of the bed lies a small living area of this Airbnb vacation rental. Feel free to just sit back and unwind on the armchair while watching a movie. Well-decorated and vibrant, the bathroom comes with some basic toiletries, towels and also features a deep Jacuzzi tub. Fill it up and just pamper yourself with a nice and warm soak. Off your own private entrance is a two-seater outdoor dining set where you can watch the sights and sounds of the neighbourhood. However, for a more private outdoor experience, you can sit at the patio and admire the peace and quiet of the garden instead. Relax in the fluffy armchair in the reading nook of this lovely Airbnb room and enjoy a snack or have a sip of water. From there, you can jump right into bed and have a restful sleep in the plush queen-size bed. Wash yourself up with ease in the amazing and well-equipped shared bathroom. If you’re feeling in the mood for socialising, you can relax in the shared living room while watching TV with your host. You’re also allowed to prepare a simple meal in the shared kitchen or just store your snacks in the pantry. Catch up on some peaceful sleep in the cheery and well-decorated bedroom of this Airbnb home, and you can go about your daily business with ease in the quirky and well-equipped bathroom. You can bring along your laptop and complete some work if necessary in the bright office space. It’s also the perfect space to practise yoga! If you’re feeling hungry, you can have a snack in the shared and well-stocked kitchen. And feel free to warm up by the firepit in the shared back garden. When you’re relaxing in this commodious and dazzling Airbnb bedroom, you’ll have a great view of the garden from the bed. There’s also a desk in the room so you can complete work while on vacation. When you want to wash up, you can make use of the beautiful and well-equipped bathroom to do so. From the bedroom, you can explore the wonderfully maintained garden and admire the koi pond. Or pamper yourself with a warm and relaxing soak in the hot tub. Reno is truly a great city to rest and relax, making it a wonderful vacation spot. The city is slowly shedding its old disreputable persona and slowly becoming a more wholesome and cultured city. 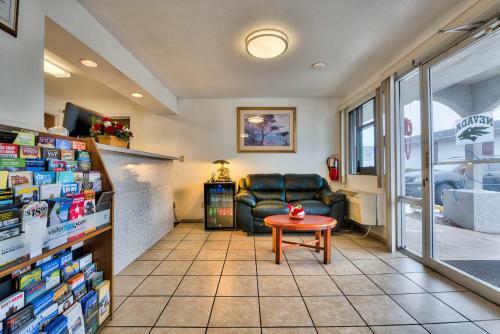 Thus, how about heading on down to Reno for a rejuvenating holiday in one of these Airbnb vacation rentals?